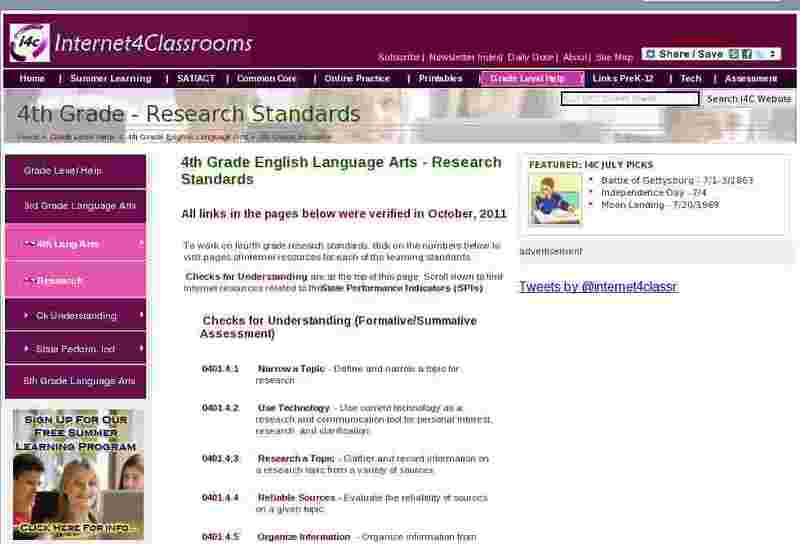 To work on fourth grade research standards, click on the numbers below to visit pages of internet resources for each of the learning standards. Checks for Understanding are at the top of this page. Scroll down to find internet resources related to the State Performance Indicators (SPIs). 0401.4.1 Narrow a Topic - Define and narrow a topic for research. 0401.4.2 Use Technology - Use current technology as a research and communication tool for personal interest, research, and clarification. 0401.4.3 Research a Topic - Gather and record information on a research topic from a variety of sources. 0401.4.4 Reliable Sources - Evaluate the reliability of sources on a given topic. 0401.4.5 Organize Information - Organize information from text or technological sources using a graphic organizer. 0401.4.6 Write a Paper - Write a research paper using a three or more sources and notes taken using the sources. 0401.4.7 Use Resources - Utilize the dictionary, glossary, thesaurus, and other word-referenced materials. 0401.4.8 Appropriate References - Use and discern appropriate reference sources in various formats (e.g., interviews with family and community; encyclopedia, card/electronic catalogs, almanacs, magazines, newspapers). SPI 0401.4.1 Appropriate Source - Select appropriate sources from which to gather information on a given topic. SPI 0401.4.2 Rank Reliability - Rank the reliability of sources on a given topic. SPI 0401.4.3 Graphic Organizer - Construct a graphic organizer to organize the information gathered. SPI 0401.4.4 Available Information - Differentiate among the kinds of information available in a variety of reference materials (i.e., dictionary, thesaurus, atlas, encyclopedia).